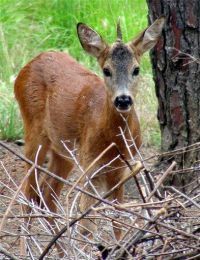 (source http://www.physorg.com/news132406601.html) A unicorn deer named ‘Unicorn’ was born June 11, 2008 in Italy. This appears to be a genetic defect, but it was a natural occurrence. It remains to be seen whether it has magical healing properties in its horn, etc. Perhaps this genetic defect has occurred previously, and perhaps it is the source of medieval tales of these beasts. Since this creature was born in captivity, hopefully it can be bred. This entry was posted in random ideas. Bookmark the permalink.